Aviation Updates Philippines - SkyJet Airlines is set to launch flights to Baler where it plans to operate 3 weekly flights from Manila. Baler, the capital town of Aurora, is said to be famous because of the historical siege and killer waves from Sabang Beach. 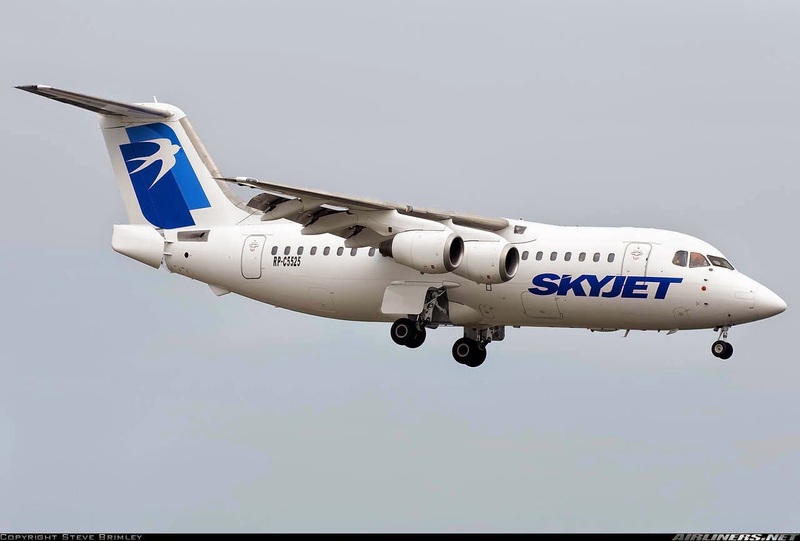 SkyJet will fly to Baler using its 79-seat British Aerospace BAe 146-100 aircraft which is compatible to operate in short and unpaved runways and is considered as the safest aircraft in the world. SkyJet's four-engine BAe 146 is built for safety and speed which allows lesser travel time. Sabang Beach, which is famous because of its so-called "killer waves", is named after its location Barangay Sabang, Baler. Waves are relatively calm in the month of March to June, which provides good beachfront for swimmers. During October to February, large waves come to meet the surfers. The boutique leisure airline serves flights to Batanes, Boracay and Coron. The airline launched its flights to Caticlan on April 15, which is Boracay's main gateway aside from Kalibo. However, SkyJet dropped flights to Vigan. Due to SkyJet's popularity, the airline is said to be the "airline of the stars" as it carried several TV personalities just like Kris Aquino, Anne Curtis, Solenn Huesaff, Phoemela Baranda, Isabel Daza and more travelling them to famous tourist attractions nationwide. Magnum Air Inc, which is known as SkyJet Airlines, is the country's first leisure airline which serve flights to Batanes, Boracay and Coron all from the Philippines' capital city, Manila. The airline started operations using the BAe 146-200A and Manila to Basco for its initial operation.